Clos Du Val takes its name from a French term for small vineyard estate. The winery was created by John Goelet in 1972. John Goelet deserves credit for being one of the first French wine makers to come to the Napa Valley in the modern era. The first few vintages of Clos du Val were made from purchased grapes, as the newly planted vines were not ready yet. It took only a few years for the reputation of Clos du Val to spread. In large part, this is due to Clos du Val being one of the California wines included in the famous 1976 Judgment of Paris tasting. 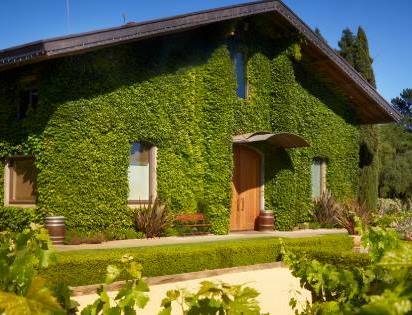 Clos du Val started out with 150 acres of vines in the Stags Leap District. The vineyard, originally planted between 1972 and 1974 was cultivated with mostly Left Bank Bordeaux grape varietals, Cabernet Sauvignon, Merlot and Cabernet Franc. However, a small portion of vines was also planted to Zinfandel, as the grape was popular at the time. The next expansion for Clos du Val was when they added 180 additional acres in Carneros that was soon planted with Pinot Noir and Chardonnay. Today, much of their Carneros vines have been changed to Cabernet Franc and Merlot. Clos du Val continued adding vineyards. Their next purchase is probably their best land. It was 18 acres of vines in the State Lane Vineyard. Clos du Val was a popular winery during the 1970’s and into the 1980’s, but the wines fell from favor as they were not picking fruit at the same level of ripeness as their neighbors, the yields remained high and they used machine harvesting, instead of hand picking. Their style of old school Cabernet Sauvignon fell from favor. In 2013, Clos du Val released their first single vineyard wine, Joie du Vin, in honor of their founder. Clos du Val produces several Cabernet Sauvignon based wines today; Limited Release, Stags Leap District, Reserve and Joie du Vin. Clos du Val also produces Merlot, Cabernet Sauvignon, Pinot Noir, Chardonnay and Sauvignon Blanc. Clos du Val wines are best served at 15.5 degrees Celsius, 60 degrees Fahrenheit. The cool, almost cellar temperature gives the wine more freshness and lift. Young vintages of their red wine can be decanted for 1-3 hours, depending on the character of the vintage. This allows the wine to soften and open its perfume. Older vintages might need very little decanting, just enough to remove the sediment. The red wine of Clos du Val is best served with all types of classic meat dishes, veal, pork, beef, lamb, duck, game, roast chicken, ribs, hamburgers, barbecue, roasted, braised, grilled dishes and stews. Clos du Val is also good with Asian dishes, hearty fish courses like tuna, salmon, mushrooms and pasta. The white wine of Clos du Val is best served with all types of seafood and shellfish, sushi, sashimi, chicken, veal, pork and cheese. Medium bodied, with a strong, oaky undertone that tries to smother the green apple, lemon and citrus notes. The debut release of this new wine, here you find loads of spicy, ripe, dark fruits, smoke, tobacco and pepper on the nose. Full bodied, forward, lush, ripe and fresh, this can be enjoyed on release. Dark, juicy, sweet, fleshy fruits, with an earthy, smoke filled, licorice and blackberry character. Medium/full bodied, with round textures and a sweet, fruit filled finish is found here. Ruby colored, with a peppery, fresh, crisp, red fruit character. The wine is medium bodied, forward and leaves with with crunchy, red fruits in the finish. Medium bodied, fresh, easy drinking style of wine with soft textures, an open personality and ripe black cherries. Medium bodied, fresh, bright, lively, with a focus on fresh red fruits, with a forward personality and soft, easy to like textures. Perhaps, not a lot of depth, but it's fun and easy going. Perfect with grilled burgers on a warm, Saturday afternoon. The ripe, Cabernet Sauvignon dominated blend offers fresh, ripe, sweet, black cherries, blackberry and earthy fruits. Medium bodied, and forward, this is not a big wine, it's refined, soft and elegant. This is probably drinking at its peak today.